Trillanes shamed the highly revered stature of the long gray line. This seems to be the only words that could describe how Trillanes performed at the senate inquiry on drug-related killings on Thursday, according to some PMA alumni and cadets. The remarks from the alumni of the Philippine Military Academy (PMA) came after Trillanes intimidated co-senator Alan Peter Cayetano after the latter tried to interpolate a witness during the senate inquiry. 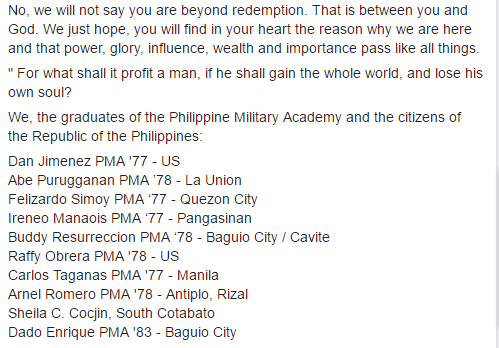 The open letter was started by Abe Purugganan of PMA Batch '78 and Dan Jimenez of PMA Batch '77 on the Facebook group TheLongGrayLine, a group dedicated to PMA alumni and cadets. De Lima and Trillanes brought in a witness who then testified that President Duterte ordered the killing of several individuals during his term as the city mayor of Davao. In the subsequent reports, former CHR chair Etta Rosales and the Ombudsman both admitted that since the start of their probe in 2009, no evidence was found to link Duterte and the police to the killings. 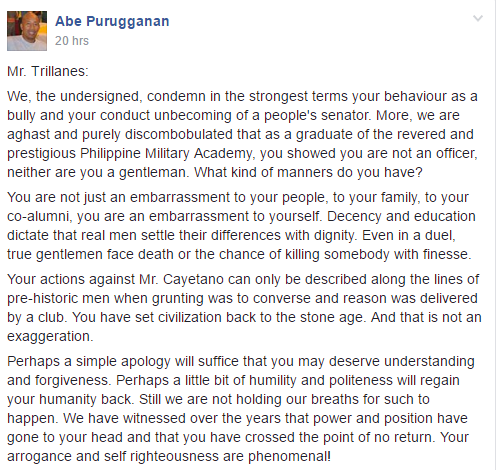 PMA Alumni were particularly irked by Trillanes' demeanor describing it "along the lines of pre-historic men." We, the undersigned, condemn in the strongest terms your behaviour as a bully and your conduct unbecoming of a people's senator. More, we are aghast and purely discombobulated that as a graduate of the revered and prestigious Philippine Military Academy, you showed you are not an officer, neither are you a gentleman. What kind of manners do you have? You are not just an embarrassment to your people, to your family, to your co-alumni, you are an embarrassment to yourself. Decency and education dictate that real men settle their differences with dignity. Even in a duel, true gentlemen face death or the chance of killing somebody with finesse. Your actions against Mr. Cayetano can only be described along the lines of pre-historic men when grunting was to converse and reason was delivered by a club. You have set civilization back to the stone age. And that is not an exaggeration. 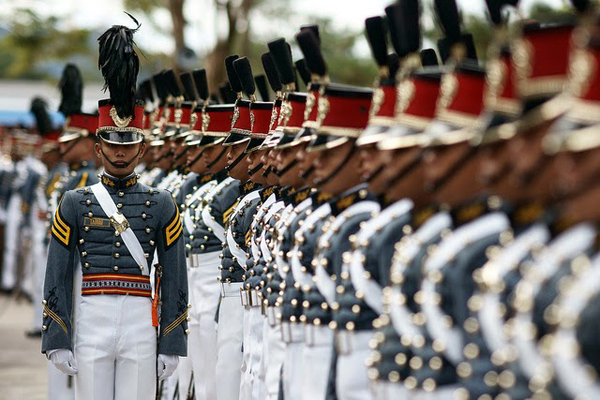 The open letter added that Trillanes' conduct was an exact opposite of what is being taught the the prestigious military academy. Perhaps a simple apology will suffice that you may deserve understanding and forgiveness. Perhaps a little bit of humility and politeness will regain your humanity back. Still we are not holding our breaths for such to happen. We have witnessed over the years that power and position have gone to your head and that you have crossed the point of no return. Your arrogance and self righteousness are phenomenal! No, we will not say you are beyond redemption. That is between you and God. We just hope, you will find in your heart the reason why we are here and that power, glory, influence, wealth and importance pass like all things. The open letter asks for PMA alumni and cadets to affix their names if they feel the same way towards Trillanes' actions. And as of 6 am, September 17, 2016, over 230 PMA alumni and cadets have signified their support. The Facebook post continues to gain traction and is continually being updated.